The Icelandic coat of arms is a shield with a silvery cross in a sky-blue field with a fiery red cross in the middle of the silvery cross. The arms of the crosses shall extend entirely to the edges of the shield in all four directions. The width of the silvery cross shall be 2/9, and that of the red cross 1/9, of the width of the shield. The two upper blue rectangles shall be equilateral, but the lower ones shall be one third longer, and equally wide. The blue and the red colours are the same as in the national flag. The coat of arms appears on the flag of the president. On 1 December 1918 Iceland became a sovereign and independent Kingdom in personal union with Denmark under a common king. The establishment of Iceland as an independent kingdom had consequences for the national symbols of the country: the coat of arms and the set of national flags. 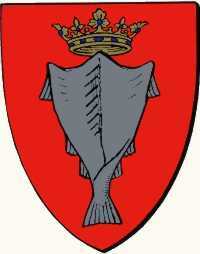 The first coat of arms (1919), illustrated by Hermansson (1991) contains a crown. Iceland's first coat of arms bore a falcon on a blue background. This is a symbol of Danish colonialism..
As Iceland was made a separate kingdom, it got its own distinct heraldic crown, different from the Danish royal crown - as can be seen from the 1919 coat of arms. The crown of Iceland was decorated with blue and red stones, blue pearls, and a blue hat, and had an oval decorated with blue bands and a cross on top. This crown model was used not only on the coat of arms, but also on various special flags and ensigns. The crown was removed when Iceland became a fully independent republic in 1944. 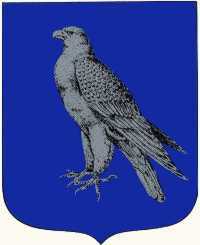 The white falcon on blue remained the arms of the King. In fact, the falcon was only removed from the Danish arms in 1948, when the Danes finally came to accept Iceland's independence. Thereupon the King of Denmark sailed his fleet south along the land, and then to Denmark. But Earl Hakon had all the land cultivated again and paid no more tribute to the king of Denmark afterwards. A clear warning, one could say, to the Danish masters that the Icelanders were ready to fight for their independence once again. The arms with the Icelandic flag colours that the (Danish) king was at first reluctant to accept are actually protected by the ancient guardians that scared the old Danish king of the saga from invading. Achen mentions a theory (he does not give a source) that the guardians are in fact references to the symbols of the four evangelists (ox: St. Luke; eagle: St. John; lion: St. Mark, giant: St. Matthew). Munksgaard, Jan Henrik: "Militære rang- og kommandoflagg i Norden III. Island", Nordisk flagkontakt, No. 21, 1995, pp.